Here are a few updates from a very long and busy day. Trevor left early for his overnight stay in Kazemeni – we are confident he is doing well. As soon as the new van arrived, the rest of the team loaded up the lamps and teaching supplies and headed to Boyani, it’s a long drive on some very rough dirt roads. 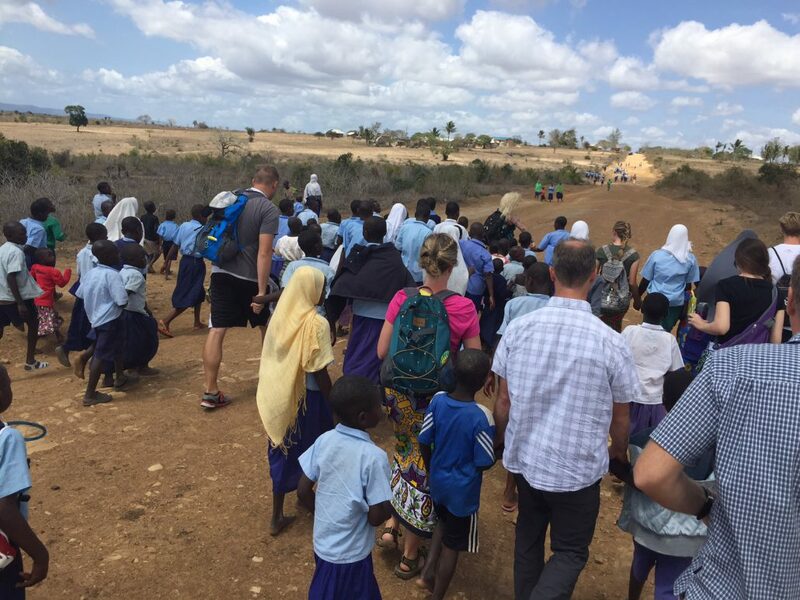 As we approached the Boyani village, the children met us 1/2 kilometer from the village singing songs and full of energy, we quickly climbed out of the van and walked to the village with them. What a treat it was for those of us who had not seen the schools and the mural painted by the Grant Victor team last year. This building is truly a landmark along that long dirt road connecting the villages. The Senior Teacher, Amos, and the teaching staff put together an opening ceremony introducing us to the community and the students. We were able to make a small presentation where a few things were announced. 1. The school has a need for blankets for the 8th graders who are boarded at the school. We were able to let them know that 16 blankets were donated for Todd’s son Connor’s eagle project that we were able to leave with them. After the ceremony we asked Amos about where the students sleep and he said the classroom is used as a class in the day and a dorm room at night with the kids sleeping on mats on the cement floor. 2. Glade announced that money had been raised to build a larger cistern for the school. This announcement received a lot of applause. Boyani is a village in a very dry desert area that typically gets a few rainstorms a year with the large rain storm in the March, April and May timeframe. As we were walking the kids to the village, Voya, the equivalent of the PTA President, told Steve that the village is struggling because of the lack of water. They have not received any rain since February, the current cistern is dry. 3. 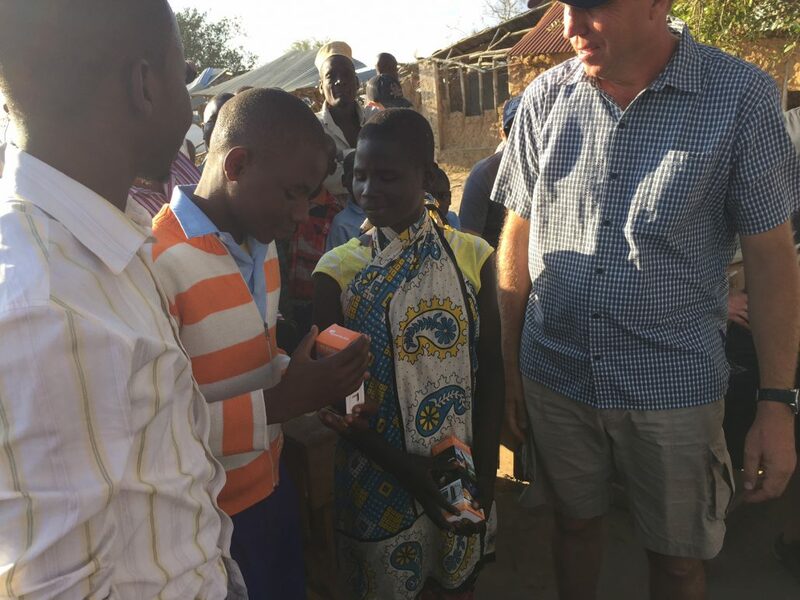 Glade also announced that Grant Victor and its customers have donated enough solar powered lights for each house in Boyani to have one light. This, too, was received very well. The lights were handed out later in the day, after a short soccer game where the school team defeated the Grant Victor Team 2-0. We gave a very valiant effort but was beat by barefooted kids running around on very uneven ground with small weeds and bushes growing. As the lights were handed out, the goal was to give one to each household. The community gathered together and a process was put together. The orphans were first followed by the single mothers and single fathers. For those of us who can’t speak the language felt the loud discussions were a sign of hostility for people who may or may not be getting a light but later learned there were discussions about how to deal with the polygamist families and those who were unable to attend. We learned also that approximately 50 more families need lights so we will have to send more soon. 4. After Glade’s announcements, Burt announced that a water truck was on it’s way to fill the buckets for the families and the cistern would be filled. The excitement was so high with this announcement. 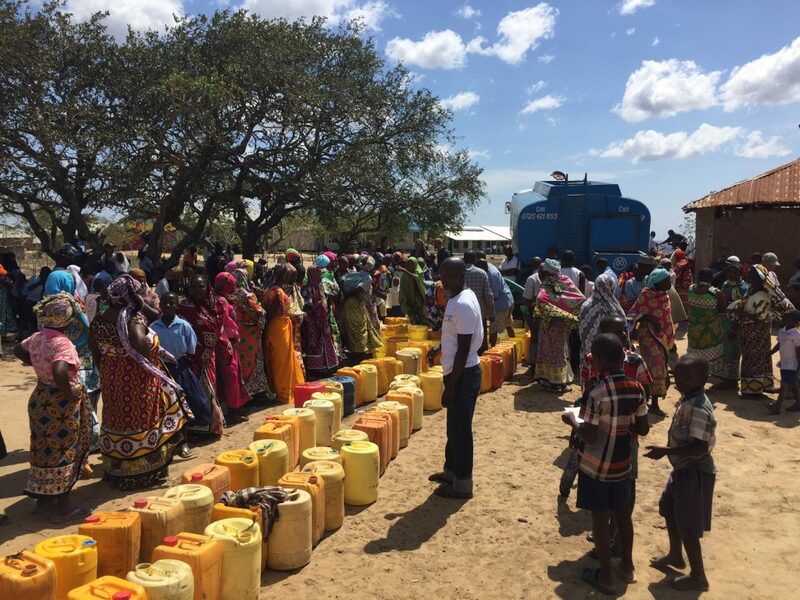 As mentioned above, the lack of water is having a huge impact on the community. Due to the lack of water near by, the women are walking close to 20 kilometers round trip each day to fill up one 5-gallon bucket. The women were excused to go get their buckets. The truck showed up a little while later and the line of buckets was endless. We later learned that some families were able to get four buckets filled. Unfortunately, not all buckets were filled and the cistern is still dry so two more trucks were ordered, one for the cistern and one for the remaining buckets. Their needs should be met within the next 24-hours. We also taught four classes. Details of the classes will be shared another day as we have the opportunity to teach again tomorrow and Wednesday. During the Grant Victor fundraising event, Ben’s wife worked with the eye doctors she works with to donate multiple pairs of children’s eye glasses. 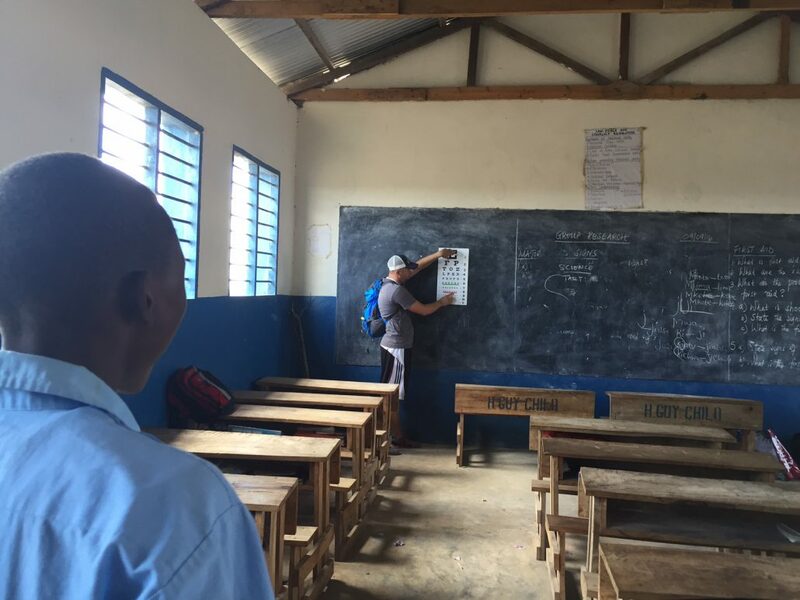 We were able to meet the needs of six children who have been struggling to see the chalkboard. What a joy it was to see the eyes of the children light up when they could read the eye chart after struggling during the initial eye test. Unfortunately, a few children’s eyes were so bad that we couldn’t help them. It was gut wrenching to tell them we couldn’t help and the best thing was to sit close to the front of the class. We are all very tired but are excited for the opportunity to paint the mural on the Kangakamo school tomorrow and teach more students.